Quite sweet with the malt bill and the addition of honey. The hop is present but faint. 12 oz can, dated 8/9/18 - been in my fridge since a trip to VA last month. pours a murky reddish brown color, very cloudy. thick white head, good lacing and head retention. aroma is sweet malt and also grassy, citrus hops. flavor is a bit stronger on the honey flavor and not as pleasant as the aroma - with a lingering aftertaste that is odd - maybe a bit stale. medium bodied, a bit slick of a mouthfeel. Poured reddish brown with tan head. Little to no lacing. Smells sweet and floral. Taste is smmoth, sweet with a citrusy mouth feel. After taste is a little bitter. Great beer. I love it. Maybe favorite this year so far. Poured from a can into a tulip glass. A cloudy brown amber, much more interesting than the standard red I expected, and with a creamy tan head. Smell/taste is only a little sweet, with citrusy hops and a woody aftertaste. Mouthfeel is full for an ale. From the bottom of the can: "11/03/17 12:15:49"
Appearance: The body of the beer is an opaque tawny brown. The head is very large and creamy textured with an off-white color. It has excellent retention and lacing. Aroma: It has a soapy smelling wildflower aroma. It is very pleasant and inviting. It smells very much like early Summer on a prairie. Taste: The flavor is very interesting because it starts out with this mango skin flavor which is tropical and contrasts greatly with the aroma. There is just a touch of what tastes like rye flour. The aftertaste has more of that soapy and floral character that is found in the aroma. Mouthfeel: It feels a bit thick and textured with a medium and dexrinous body. 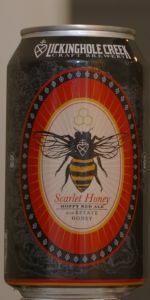 Overall: I really didn't get any sweet honey or even mead character from this beer, although it states that it is made "with ESTATE HONEY." In a nutshell this beer is a floral amber ale. I would recommend it as a nice picnic beer for the early or mid-Spring. It would be a good beer to sit and drink contemplatively or while enjoying a good book. I would buy it every now and then. L) Pours a lovely, deep ruby tinted honey color with a creamy white head. Decent Retention. S) Fresh, citrussy, hoppiness dominates the nose. If I was told this was a pale ale, or even an IPA, I would have believed from just a sniff. The citrus zest spiciness is juxtaposed by a smidge of lovely crystal maltiness. T) The taste is incredibly hop forward. Truth be told, this should be considered a red IPA. But it is delicious nonetheless. There is plenty of juicy citrus and deep L60 crystal nature to this brew, and the profile lingers after sipping. A luxurious and wet brew for sure. F) The beer has a medium to high carbonation and a medium body for the flavor profile. I would almost like a little bit less carbonation with the flavors at play, but everything is well within acceptable ranges. O) I love Lickinghole, I am happy to see them producing 6-pack beers for everyday drinking. This is an easy recommendation for malt and hop lovers, what a lovely red.